A local museum which aims at documenting, preserving and developing the history as well as technology of the Banywaranda, Bakiga, Baziba plus the Banyankole people, has been opened in the district of Ntungamo, graciousness of a prominent hotelier based in Kampala Nathan Matsiko. 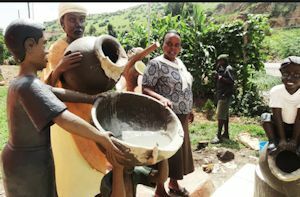 This museum which is found at the border of Ankole and the Kigezi Kingdom in Rwahi trading centre, opened its doors to the public in February 2014. One of the administrators Harriet Katushabe said that this museum was constructed to safe guard the great heritage of this area for the good of the young generation as well as tourism. She also said that this museum called ‘the Great Lakes Museum’, will display the past lifestyle of those groups of people. Katushabe added that children should be encouraged to be grateful for our history and have a chance to see and even experience how the forefathers lived so that they can plan for their future. You will be able to see ancient household items such as cooking utensils, hunting equipment, sleeping mats, fighting gear that was used in ancient wars as well as musical instruments. On display there are also items of the first modern technology such as old radios, toys, Polaroid as well as clothes produced back in the nineteenth plus twentieth Centuries. the things displayed were acquired through direct purchase from some of the local people, especially the elderly. She advised children not to spoil items which were particularly used by their grandparents since they can be very useful. the operations manager George Aketch said that the museum is as well pointed at marketing local technology which is slowly dying out, though is still useful and eco-friendly in contrast to the one that was produced by Europeans during the early colonial times. There are 25 environmentally friendly cottages at the museum for accommodation. Different facilities at the museum incorporate a children’s playground, a meeting conference and sculptures depicting Uganda’s rich history in style, culture, fauna and flora. The local people staying near the museum have also started feeling the consequence of this establishment since they sell their produce from the garden to the hotels.